Namhae is a beautiful island off the southern coast of Korea. 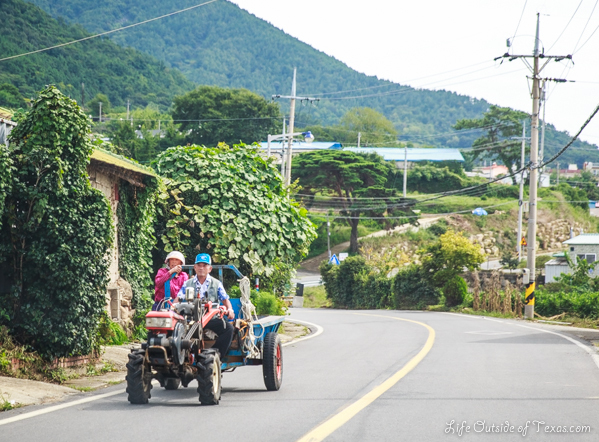 It is known as the Treasure Island of Korea and is famous for farming so don’t be surprised if you get stuck driving behind a tractor or two. 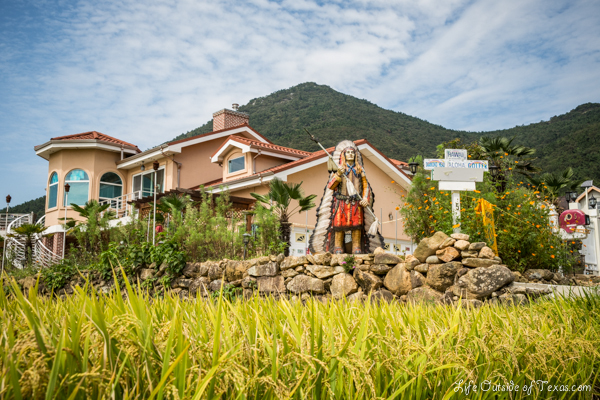 Here are a few of my tips on what to do if you spend a weekend in Namhae. 1. Forget about the Hilton. Stay in one of the many seaside pensions and enjoy the gorgeous views. We stayed at the Hi Class Pension, but there are loads of other [more affordable] pensions on the island. If you want to do some research, try searching 남해 펜션 on Naver and browsing through the results or have a Korean friend help you. This isn’t a proper tourist attraction in Namhae, but I found it so charming. It’s tucked away in the middle of a farming area and the art is really lovely. 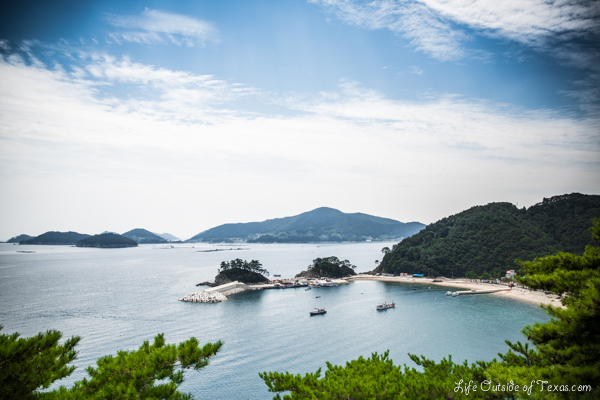 The views along Namhae’s winding coastal road are really amazing. If you’re prone to motion sickness, it’s not a bad idea to take some medication before driving around Namhae. Korea is the world’s largest consumer of garlic and Namhae is famous for growing garlic. We meant to stop by Garlic Land, but missed it. If you want to learn more about the significance of garlic in Korea, check it out. This spot is on CNN Travel’s list of 50 Beautiful Places to Visit in Korea. It was a little baren when we went, but it looks like a fun place to visit when they are planting the rice. Check out my post on the Darangee Village for more information. During tough times in the 60’s & 70’s, Korea sent nurses and miners to Germany in exchange for relief funds. 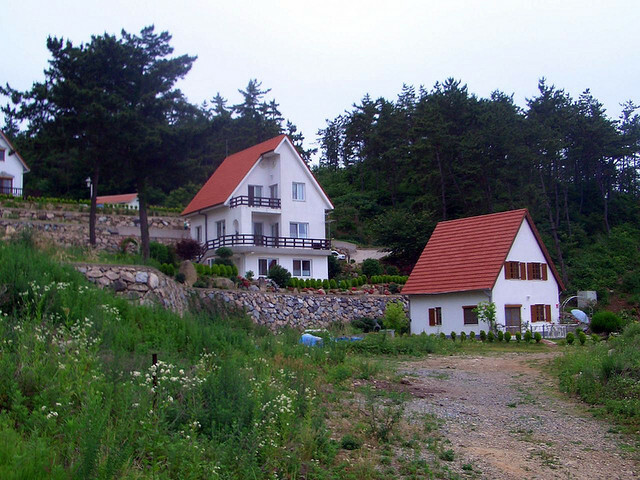 The village, containing German style homes, was built to welcome these people back to Korea. The American Village was built to lure Korean-Americans back to their homeland with its beautiful surroundings and American suburbia style homes. 8. Go to the beach! 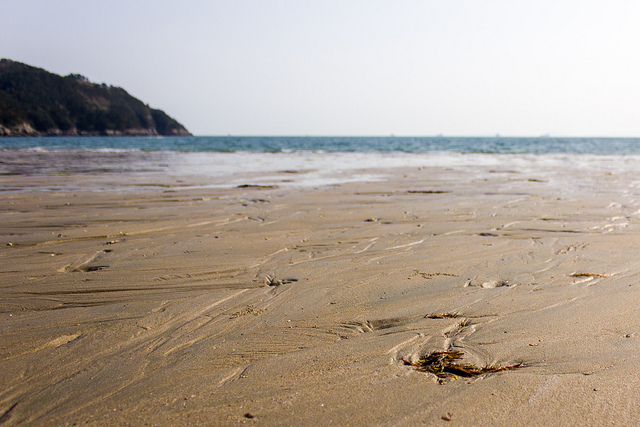 Namhae has two really nice beaches, Songjeong Beach and Sangju Beach. Both are located on the south eastern side of the island. I know I said to forget about the Hilton, but if you’re into golf, you might want to play a round at their 18-hole coastal course. If you want to play during the weekend, be sure to call ahead to make a reservation. This entry was posted in Gyeongsangnam-do, Namhae and tagged American Village Namhae, art village namhae, Darangee Village, 보물섬마늘나라, Garlic Land Namhae, German Village Namhae, Hilton golf course Namhae, Hilton Namhae, namhae coastal highway, namhae coastal road, Namhae Island, Rice Terraces, Sangju Beach, Songjeong Beach, Things to do in Namhae by Meagan & Dave | HappilyEverExpat.com. Bookmark the permalink. Really curious about the American village. I had heard that it existed, but little more than that. It would be fun to see how they re-create an American suburb. I went on the army base here in Busan (Camp Hialeah) many years ago (it’s closed now) which was the closest thing to an American village I’ve seen here: a diner, grassy lawns and parks, softball diamonds, barbecue grills and picnic tables, tree-lined winding roads. It was very not-Korean. 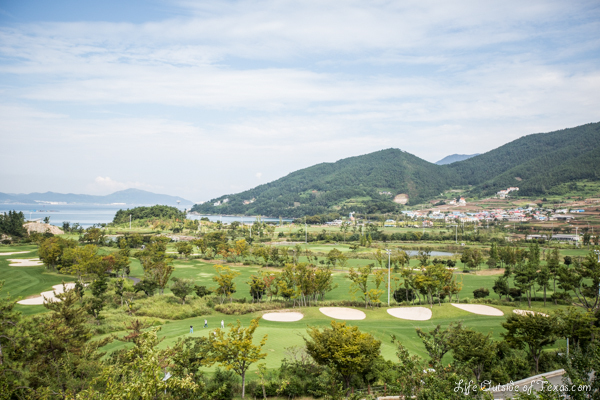 Namhae looks wonderful! Those views over the water look beautiful, and the rice terraces have been on my list to see for awhile. I would love to check out the art as well–I always love that type of style. The American and German villages sound interesting–would be strange to see them in Korea! Ha! I love the Simpsons street art! Looks like quite the varied cultural landscape over there. I was supposed to go here, but the timing didn’t work out! Now I’m sad I missed it. Gorgeous. The American Village cracks me up. Everything else looks beautiful. I’m a sucker for almost anywhere with a beach. It is interesting how they use a statue of a Native American in the American Village. The house looks just like many you will find here. Between the American Village, German Village, and the bootleg Simpsons mural on the Art Village, I’d n ever know this was Korea if you hadn’t told me. But those rice terraces do look gorgeous. Cute town! It’s nice to hear about something other than Seoul! So me and my husband just got a car, and we’re thinking about driving down to Namhae sometime during Lunar new Year! What do you think about going there during the Winter? Looks gorgeous, we’ve never been! I’m sure it’d still be beautiful in winter. Though as you know, Korea goes brown in winter so you’ll be missing out on the beauty of the rice fields and other greenery. It’s definitely gorgeous in summer when everything is green. If I were to go again, I’d try to go around Buddha’s bday. I think that’s when they plant the rice. I think you can actually book tours to watch them plow with the ox, but it’s hard to find much information. You’ll love having a car! 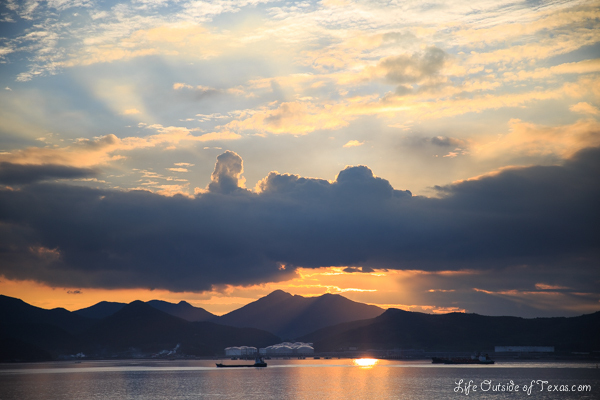 Geoje is a great trip as well. Lots of beautiful scenery and the POW Camp is interesting (and a bit bizarre) . I have a lot of road trips that we took last summer to write about. I’m not sure. We are staying put this time around because the roads are just too congested during Seollal and Chuseok. We almost missed our flight over Chuseok because of traffic. Heading to Busan was much less busy than heading north though. I imagine the people heading towards Daegu might STILL be stuck on Highway 1. The weather is supposed to be great (except Saturday). I suggest going to Busan and checking out some of the less-known sites, like the burial mounds in Dongnae (but they are much prettier in the summer when they are green). Or Gyeongju. OR you could come to Ulsan for a game of Cards Against Humanity with us. You could always take the slow train. I know they’re usually busy, but Gyeongju and Ulsan are only about an hour away so it’s not that far to stand. You two are always welcome to come over for some Cards Against Humanity. We have a spare bedroom and everything. I loved Namhae, it’s so close to me and one of my favourite places in Korea. I didn’t make it to the German village, but I wasn’t keen on stepping on people’s doorsteps just to take pictures anyway. Loved the darangee village, and the rocky coastal roads 🙂 lovely post Meagan. Ah! I went to Busan about a month ago and had planned on making a a day trip out to Namhae. My friend and I made our way to the bus terminal but realized we had went to the wrong one. The other bus terminal that would have taken us to Namhae was about an hour away by subway. Since our time was already limited we decided to just spend the rest of the day in Busan. This post and your pictures have convinced me that I still need to go at some point. Seems like the kind of place I would definitely enjoy. Cheers! Absolutely gorgeous photos this place looks beautiful! Just inspired me to want to do a day trip there and I really like the idea of coming up with x amount of things do to. Great post! Just went to Namhae again this weekend and loved it. 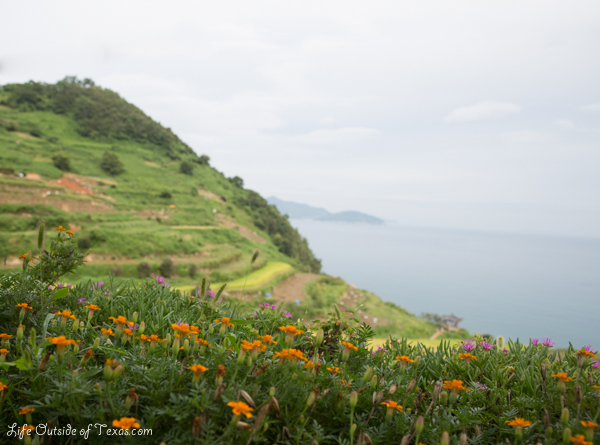 Stuck to Sangju beach and hiked Geum San. This is a great guide. One thing you could add and experience is the buffet at the Namhae Hilton. For about 60,000, you can gorge yourself on American cuisine to your heart’s content. Pricy, but delicious. Thanks for sharing! I hope you have a great time! Namhae is so beautiful.